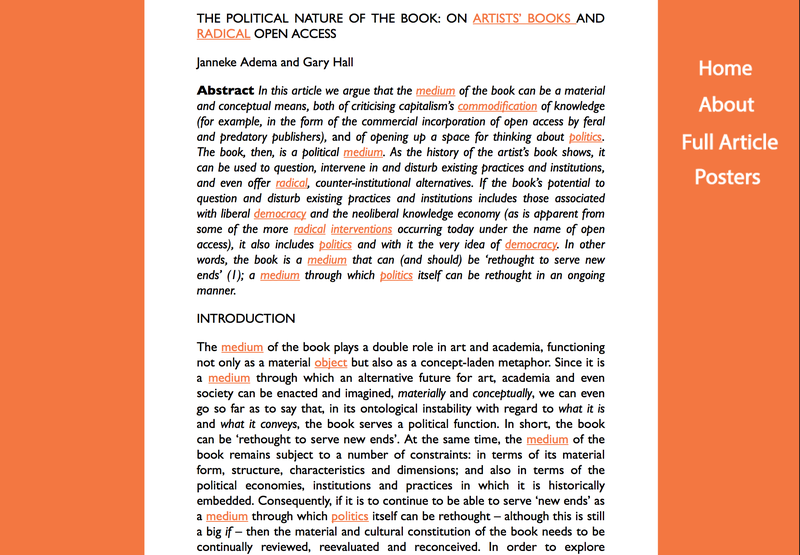 Last spring I worked on a project together with 2nd year design students Nabaa Baqir, Mila Spasova and Serhan Curti to create an alternative take on, or an artist’s book out of the article ‘The political nature of the book. 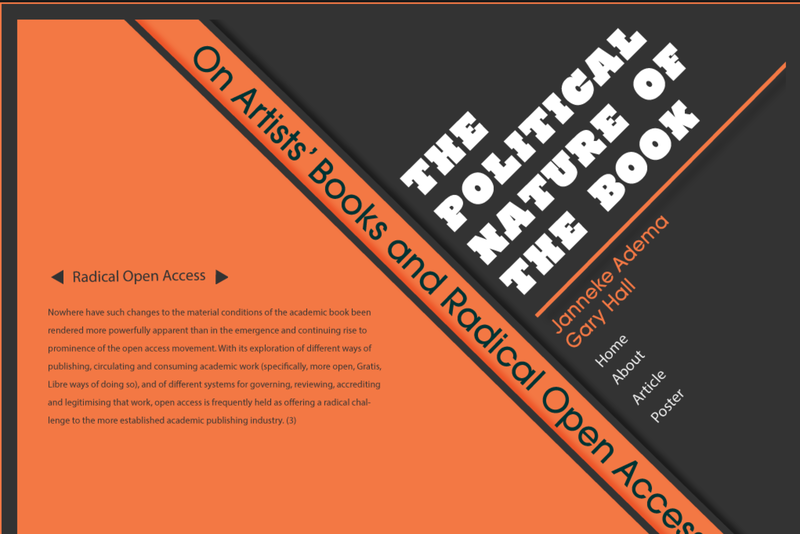 On artists’ books and radical open access’, which was written by myself and Gary Hall and was originally published in New Formations. This project is part of a larger research project on performative publications which I am conducting at the moment. 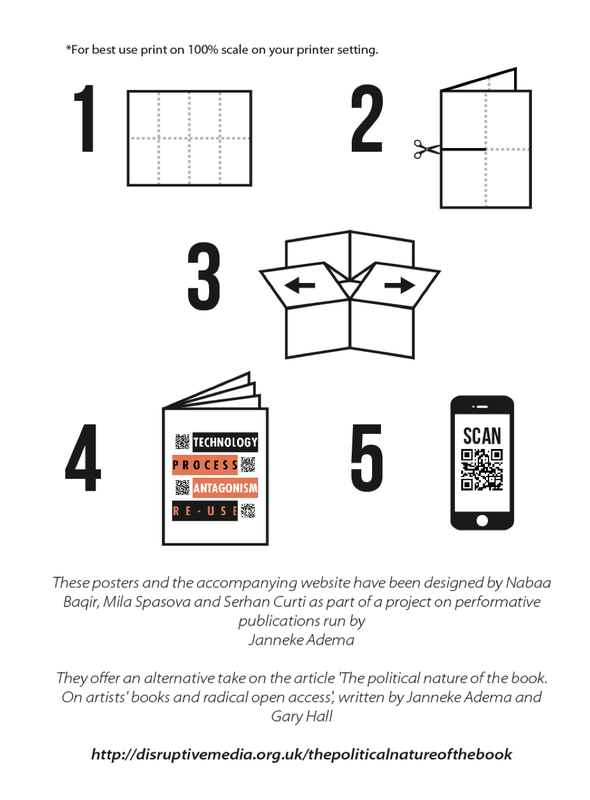 The project is now live at http://disruptivemedia.org.uk/thepoliticalnatureofthebook/index1.html and consists of a website and accompanying posters, which have both been designed by Nabaa, Mila and Serhan. Underneath you can find some more information about the different multimedial options offered to engage with the text both offline and online, some more thoughts on the concept of performative publications, and some reflections on how we conducted the project and the decisions we made. The website consists of 3 sections that all offer an alternative way to engage with the article, as well as to access or distribute it. The first section consists of the original postprint article text, which offers a familiar linear reading experience. The second section consists of 28 keywords, which relate to some of the main themes and topics that characterise and structure the article’s content. By clicking on them these offer an alternative non-linear route through the text, as they are connected to snippets of text extracted from the original text that refer to the various keywords. 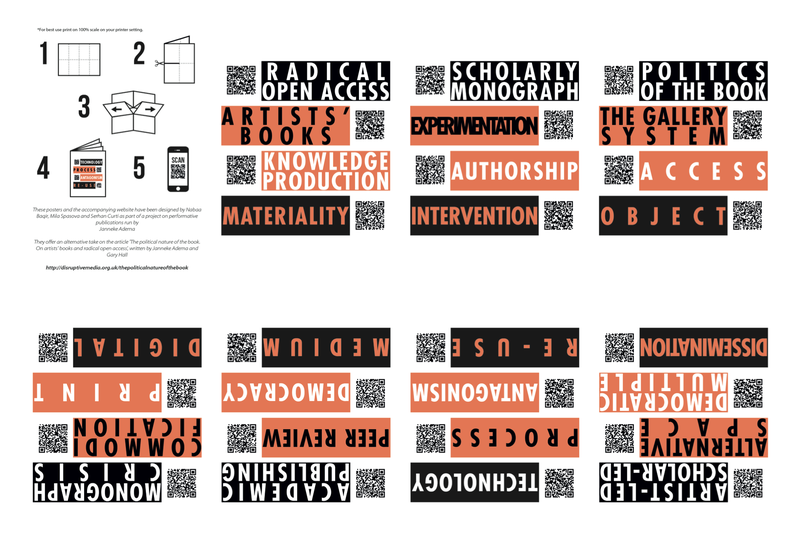 The third section offers an offline engagement, consisting of 7 posters that can be printed off at home, each with 4 keywords and 4 QR codes. The QR code for each keyword will direct the reader to the corresponding keyword on the website, offering them the availability to access the various text snippets through their mobile devices. The posters can be printed on A4 format (100% scale), which makes them easy to access with the aid of a home printer and simple to disseminate. On the backside of each poster you can find all the 7 separate posters in a reduced size with the accompanying keywords and QR codes. The poster can then be folded in such a way (see the folding instructions) that it forms a little booklet consisting of all the posters via which the entire article can be accessed. Together the website and posters try to envision what a ‘performative publication’ might be. A performative publication wants to explore how we can bring together and align more closely the material form of a publication with its content. The term performative publication was coined by Christopher P. Long. He defines it as a publication in which ‘the mode of publication performs one of the central ideas the text itself seeks to articulate and explore’. In this respect this concept relates to Katherine Hayles’ term technotext, which she defines as something that comes about ‘when a literary work interrogates the inscription technology that produces it’. Where Hayles’ term is in this sense broader and explores the relationship between text and technology, performative publications focus more on how the mode in which we produce, disseminate and consume text, influences the content and meaning of the text, or the way we interpret it. Here the accent lies more on the material agency of publications, not merely investigating its own materiality, but actively performing it. In this respect it relates to Johanna Drucker’s concept of performative materiality, where she states that ‘performative materiality is based on the conviction that a system should be understood by what it does, not only how it is structured’. In this respect this project wants to emphasise that we should have more in depth discussions about the way we do research. In which way can we ensure that we, throughout the research process, focus on the medial forms, formats and graphic spaces in and through which we communicate and perform scholarship, as well as on the discourses, agencies and institutions that shape and determine our scholarly practices? This ‘contextual’ discussion, focusing on the materiality of our (textual) scholarship and its material modes of production, is and should not in any way be separate from a discussion on the content of our work. This project came about out of a collaboration between academics and designers in an attempt to create a performative publication, in this case in retrospect—after the article was already published. The fact that this article had also been archived with a CC-BY license in CURVE, Coventry University’s research repository, meant however that the opportunity was there to reuse it, and reimagine it. 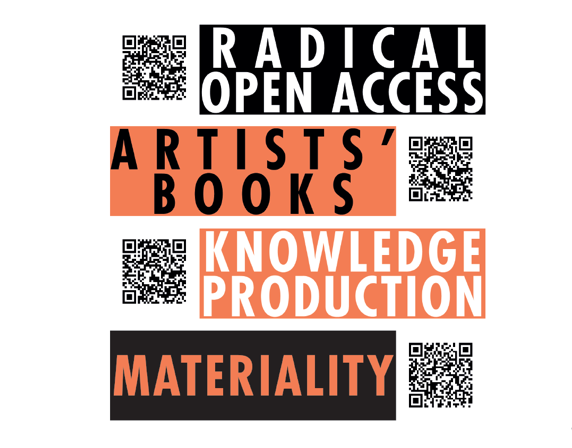 The main objective of the project was to turn the article, which focuses on artists books and open access publishing, into an easily accessible and free artist book. From the start of the project the idea was to focus on the ‘hybrid’ or ‘postdigital’ condition of our current publishing environment, according to which the choice was made to have both a print and a digital edition. The focus was on issues of access and experimentation, two of the main topics structuring the article, but also representing one of the paradoxes presented in the article: how can you be experimental, whilst still remaining accessible? The designers wanted to attempt to make the highly theoretical text more accessible by using keywords as an alternative reading of the text, or alternatively as an introduction or a glossary to the text. To ensure the article was also accessible for those preferring a linear reading experience we decided to also have the fulltext article available. This version would have the keywords highlighted however, to ensure a connection was made between this text and the keywords. The design of the posters was also based on accessibility. Designing them in an A4 format meant it would be possible to easily and cheaply print the posters off at home. It also facilitates their dissemination, making it cheap and easy to display them following a distribution method that is not commonly used for academic articles, i.e. ‘postering’. This would potentially also create a different audience for the article, an audience that normally perhaps wouldn’t interact with academic texts that easily. With respect to the experimental nature of the project, we were keen to, in the tradition of the artist book, explore the concept and the materiality of the book and its ways of dissemination. Focusing on an alternative reading situation, in which the reader has more choice in how s/he can engage with the text—making use of the potential of the digital—was key here. But by having different versions of the text available to choose from we also wanted to focus on the different kinds of engagements these provoke, through their specific (material and technological) affordances. The different versions also questioned the fixity of the text, and its bound/unbound nature. The choice for posters was similarly an expression of this, as posters—single sheets of paper—in a way embody the ultimate unbound book. To emphasise the bound/unbound nature of the book even more, we designed the posters in such a way that they could be folded back into a book, gathering all the separate posters together again in a bound format. In order to connect the print and the online version we decided to use QR codes, which offered a convenient and of course already highly familiar way to connect offline and online content via mobile technology. 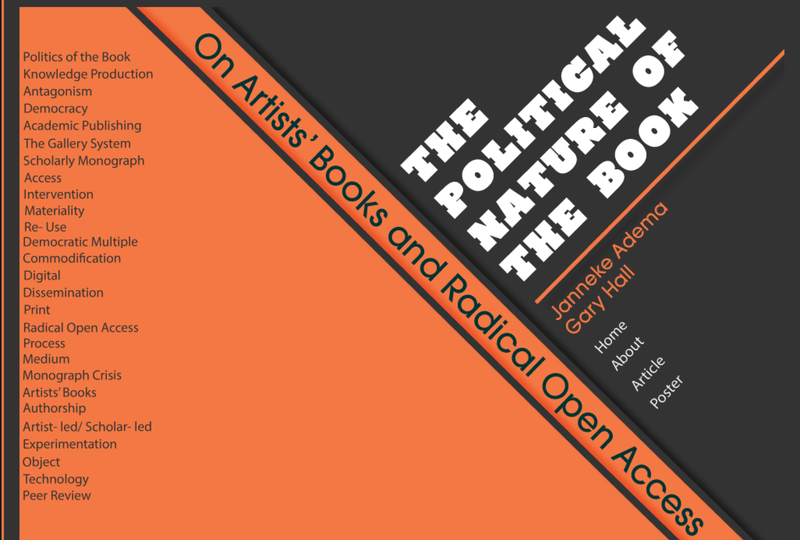 As the article focuses on the politics of the book and on radical open access, as well as on alternative distribution methods, the designers choose to use a colour scheme and design that was inspired by political protest posters. This design has been repeated throughout the website and in the design of the posters, to again bind them closer together.